In stock - low quantity. Order in the next 7 hours, 49 minutes and it will go out today! 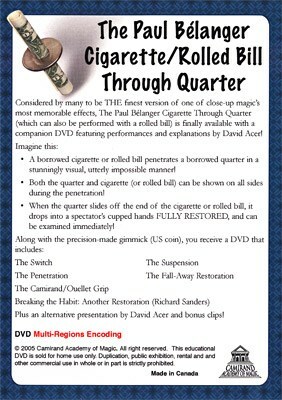 Considered by many to be THE finest version of one of close-up magic's most memorable effects, The Paul Bélanger Cigarette Through Quarter (which can also be performed with a rolled bill) is finally available with a companion DVD featuring performances and explanations by David Acer! When the quarter slides off the end of the cigarette or rolled bill, it drops into a spectator's cupped hands FULLY RESTORED, and can be examined immediately! Plus an alternative presentation by David Acer and bonus clips!